SEE DAN HAWK IN ACTION! Are you trying to inspire your team differently, or just want professional entertainment for your audience to enjoy? Dan's show is up to date with current music and pop culture themes that bring a fresh alternative. It's the perfect choice for your event! With his ease and fun-loving playfulness with his volunteers on stage and in the audience, Dan proves to be a natural entertainer. Dan has the talent and the experience to bring an awesome show to any group regardless of the number! See the show or be the show as you see the volunteers on stage learn the incredible power of their own minds! 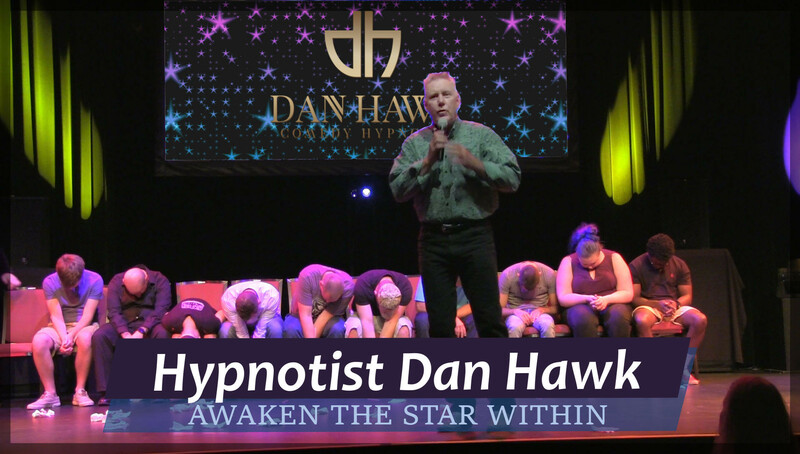 Dan offers comedy hypnosis shows and keynote speaker events to make sure your next event is unforgettable! You'll want to have him return again and again! Thank you. It was better than I ever expected! Best "EDUTAINMENT" we ever paid for. I have a better idea of what my people can really do, and so do they. I can't believe you were able to bring my husband out of his shell like that! "The strongest drive in human beings is not the drive to stay alive, but the drive to keep things the same."